You are currently browsing the tag archive for the ‘Policeman’ tag. Every year I finish these things later and later. Like I said in my ages-ago first post, it was mediocre year at Filmfest DC. So let’s finally plow through the rest of the films and move onto the 2012 Oscar season. The best of the fest, this documentary kept me utterly spellbound. 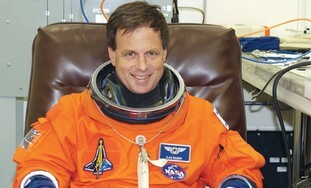 In 2003, Ilan Ramon became the first Israeli in space on space shuttle Discovery. He and the rest of his crewmates were killed when the shuttle disintegrated upon re-entering the earth’s atmosphere. His space exploits didn’t make Ramon a national hero. His participation in Israeli airstrikes against Iraqi nuclear facilities twenty years prior and a prominent career in the Israeli Air Force had already done so. The film traces this remarkable man’s life as both a man and a national symbol. Ramon carried with him into space a miniature Torah that survived Bergen Belsen and a pencil drawing made by a teenaged Auschwitz victim. Entwined into the story of Ramon’s preparations to become an astronaut are his thoughtful considerations of what it meant for him as an Israeli, a Jew, and son of Holocaust survivors to launch into the heavens. The capacity crowd in my screening seemed predominantly Jewish and based on the sniffles I heard throughout the film and the questions asked at the Q&A, they strongly responded to it. As neither a Jew nor someone with connections to Israel, I was still very moved by the film and its portrayal of an extraordinary man. It simply works as a film that should affect any audience. Clocking in at a few minutes under an hour, I think director Daniel Cohen should consider cutting it down to 40 minutes to qualify it for a Documentary Short Oscar run. But that sounds like that is not in the cards and a PBS showing will hopefully come in the future. Wherever it turns up, you should seek it out. A. Three minutes into this film my friend’s mom’s face filled the screen. 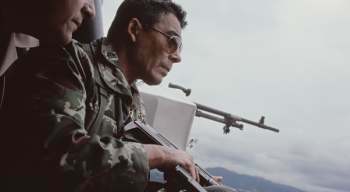 30 years ago, director Pamela Yates filmed When the Mountains Tremble, a documentary about the then-raging Guatemalan civil war and it was my friend’s mom who helped Yates connect with guerilla groups. Getting shocked out of your seat by a familiar face is an interesting way to begin a documentary. Would it be cruel to say it was all downhill from there? I don’t wish to be flip about it and maybe linearly the film didn’t truly apex right at the beginning, but it does seem to suffer somewhat from mission creep and loose editing. Yates returns to Guatemala to film a follow-up and finds a country working to mend the rifts of the past. Researchers comb through piles of police files and fields of mass graves. But the wheels of justice turn slowly and it happens that some of the footage Yates shot 30 years prior could help make the case against army commanders who committed horrible atrocities. Every ethnic and social group apparently needs its Nazi resistance film. In the past few years, the Danes had Flame & Citron, the Dutch Black Book, and French Communists had Army of Crime, which played Filmfest DC in 2010. And now French Muslim immigrants have Free Men. Tahar Rahim, of A Prophet fame, plays Younes, an Algerian immigrant trying his hand in the black market in occupied Paris. After his capture, Nazi police threaten to send him back to Algeria unless he infiltrates a local mosque and reports back on the activities of the imam, a man thought to be involved in local Resistance activities and the smuggling of Jews out of France. The imam immediately sees what the largely lapsed Younes is up to, but he lets him hang around. As he becomes more integrated in the mosque’s community and reconnects with his faith, Younes begins to join them in their illicit activities. As a tale about how oppression begets radicalism, it’s a welcome message if not breaking any new ground. Its main sin is a lack of climax. It establishes the characters but all the furtive glances around the mosque and dashes through secret hallways build to a mini-caper at best which whimpers more than enthralls. C+. Let’s finish with the worst of the fest. Policeman endeavors to tell both sides of a terrorist stand-off. The first half of the film follows Yaron, a commander in an elite anti-terrorism taskforce. He’s about to become a father but an inquiry into an incident during a previous mission could derail his career. He and his close-knit unit discuss how to handle it. Halfway through, the film abruptly shifts focus to Shira, a college-age upper-class radical. She and some chums are planning an attack to bring down Israel’s elites. The details of the plot are withheld from the viewer, but their violent intent is not. The father of one of her co-conspirator realizes something is about to go down and tries to stop them. Even as Shira and her group launch their plot and Yaron’s unit is called in to combat it, the story never really returns to Yaron, leaving the first half of the film unresolved and totally separate from the second half. With only half of a movie to establish them, I didn’t end up caring about any of the characters. It was sort of neat to see a contemporary Israeli film that depicts some part of life beyond the Palestinian conflict, but otherwise it completely dragged. D.